Sometimes I wonder what I’m a gonna do cause there ain’t enough time for all the summertime blues. And by blues I mean all those wonderful summer wildflowers that run the gamut from lavender to blue to violet and purple. Joe-pye, Eupatorium maculatum is raising his regal pale purple head along road shoulders, in fields and from almost any conceivable opening now. This large aster may grow to a height of 15 feet and the flowering inflorescence can be more than a foot high and more than a foot across. In summers past, I’ve seen beautiful stands of Joe-pye intermingled with the rich purple New York ironweed, Vernonia noveboracensis, in the open area at the intersection of Raccoon Road and U.S. 276. Tall bellflower, Campanula americana, is another robust blue wildflower blooming now. The beautiful blue flower is an inch or so across and the protruding style turns up sharply at the end. It is pretty widespread across Western North Carolina and can be found along the Blue Ridge Parkway around the Waynesville Overlook. The Parkway is a great place for summertime blues. Heintooga Spur Road and the Flat Creek Trail from Heintooga Picnic area offer a wide variety of summer wildflowers. Some of the blues to see there include obedient plant, Physostegia virginiana, which can be found along Heintooga Road. Obedient plant got its name because if you take your finger and gently push the corolla to one side or the other it will, obediently, remain in its new position. Stiff gentian, Gentianella quinquefolia, a small purple wildflower with a closed corolla may also be found along Heintooga Road as well as numerous places along the Parkway, especially the road shoulders around Richland Balsam. An especially striking summertime blue is monkshood, Aconitum uncinatum. The plant can grow 2-4 feet tall and the blue to purplish-blue, rounded, hood-shaped flowers are clustered at the end of the stem. 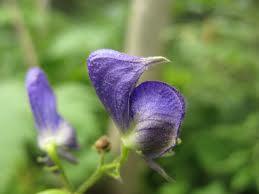 One of the most reliable places I know of to fine monkshood is along the Flat Creek Trail. I have also found turtlehead, Chelone lyonii, along Flat Creek Trail. Turtlehead also has a somewhat closed lavender-purple corolla. I think these closed corollas invite bees and other pollinators to crawl in and roll around, insuring they will collect lots of pollen. Devils Courthouse trail is another good place for turtlehead. And as long as we are talking hoods and heads it may be a good time to mention skullcap, Scutellaria incana. Skullcap grows to about three feet tall. It has square stems and opposite leaves. The lavender to purplish-blue flowers are clustered in racemes at the end of the stem. The upper part of the corolla is hood-like while the lower lip is larger and wider and there is a conspicuous patch of white near the throat of the flower. It is common along the shoulder of the Parkway. It’s not spring but it’s clearly not too late for a wildflower pilgrimage. In fact the wildflower show in Western North Carolina is far from over. Grab a hand lens and a field guide and get outside and revel in the summertime blues.